The Correa administration admitted to cutting Wikileaks’ internet access over the recent releases of strategically-timed hacks from Podesta’s account. Good for them! They claim that the decision is a high-minded refusal to intervene in the internal affairs of another state, regardless of that state’s imperial record. So good for President Correa, but this is a case where the decision is as much in the national interest as the right thing to do. How big is the threat that oil exports will be seized in a Venezuelan default? It is pretty clear that oil exports could be attached if PDVSA defaulted on its bonds. It would work as follows. PDVSA would sell oil to a refinery in the United States. Creditors would sue. The refinery would still get the oil, but a U.S. court would attach its payment to PDVSA and transfer it to the creditors. PDVSA, therefore, would get nothing from its exports. If the Venezuelan government defaulted, however, the legality would get a bit dicier. It is possible that American courts would “pierce the corporate veil” and conclude that PDVSA is an instrumentality of the Bolivarian Republic, but that is not certain. Still, it is the way many investors and lawyers (inclduing myself) would bet. So in theory sovereign default would lead to a fall in oil prices, as exporting countries with state-owned companies cast around for alternative markets. In practice, however, the courts are slow and (as mentioned above) the legalities are far from certain. It is quite possible that a defaulting country would merrily continue selling oil while its buyers merrily continued buying. After all, the buyers might not care. They would still get the oil; what do they care if the seller wouldn’t get its money? But the seller would still want its money. It would likely therefore sell to middlemen who would demand a discount and then resell the oil at some legal risk to themselves. In other words, the price of oil exports would certainly go down. The empirical question, however, given all the legal uncertainties, is how quickly it would go down. It is quite plausible that the export price of a country’s oil would not be affected by default for months or years. Well, Ecuador provides a nice test of that question! Let me walk you through the data. This is going to be a little chart heavy, so I ask readers to comment if it is ever unclear or you lose the chain of the argument. Ecuadorean oil generally trades a discount to the WTI benchmark price. That is because its oil is heavier than WTI and needs to travel from Ecuadorean fields to (mostly) Californian refineries. The below chart shows the percentage discount on Ecuadorean oil between the start of 2006 and the end of 2009. It shows a very steep fall in November 2008. That seems convincing, until you add a control. Mexico also exports heavy oil to the United States. Its discount on WTI also widened in November 2008, although Mexico did not default. Still, the increase in the discount on Ecuadorean oil was greater than the discount on Mexican oil. Might that have something to do with the default? Certainly! But to be sure of that, you need to also account for the fact that Ecuador and Mexico sell into two different geographic markets. Ecuadorean oil goes primarily to refineries in California, whereas Mexican oil goes overwhelmingly to the Gulf Coast of the United States. The price of crude oil can vary by several dollars per barrel between the two locations, given transport costs and varying demand conditions. It is true that Mexican oil recovered faster than Ecuadorean oil. In fact, after January ‘09, Pemex managed to sell its oil for roughly the average price paid by all Gulf Coast refineries, elimating a long-standing discount. PetroEcuador also managed to improve its position relative to the pre-crisis era, but it took rather longer. I do not know what happened in the Gulf Coast oil market. There are two hypotheses to explain the Ecuadorean recovery, however. One is that the Ecuador announced the form of its default in mid-2009 — a form brilliantly and perfectly designed to leave creditors without legal recourse. Freed of fears of attachment, therefore, the discount fell. The other is that May is around when PetroEcuador began selling its oil to state-owned Chinese middlemen at a significant premium. The discount on Ecuadorean oil fell because Chinese companies absorbed it. It is still possible, of course, that without the default Ecuadorean oil prices would have bounced back in January 2009 like Mexican ones and without the need to involve the People’s Republic of China. But there is no direct evidence for that story. The next thing to do would be to nail down an explanation for the disappearance of the Mexican discount in January 2009. If an explanation for that can be found that Ecuador could not possibly have replicated, then the hypothesis that the Ecuadorean default affected the export price of its oil is likely incorrect. On the other hand, if the strategy employed by Pemex was one that Ecuador was prevented from using because it was in default, then the default cost Ecuador. To be frank, my prior is that whatever happened to Mexican oil in January 2009 was likely idiosyncratic. I doubt that Ecuador suffered in oil markets for its big sovereign default. Now, this is not to say that default would be costless for Venezuela. It could prove very costly! Eventually, Venezuelan receivables would probably be attached; sooner if PDVSA debt goes into default rather than Venezuelan sovereign debt. But in both cases Venezuela could continue to sell oil. In short, the evidence from the Ecuadorean default of 2008 is not completely clear-cut ... but the preponderance of the evidence seems to be that any fall in oil prices will take some time to manifest. Sources tell me that Venezuelan ministers fervently believe that default will lead to cut off in immediate oil exports, or at least a drastic fall in realized oil prices. I suspect that they are wrong ... but it is a good thing for creditors that they do not know that they are wrong. Is Ecuador’s resource nationalism hurting it in the oil price crash? In comments, reader Cad points out that Ecuador’s oil policy has a downside: the same fixed-price policy that lets the country take all of a price windfall exposes the government to large losses in the event of a price crash. Under the best-known service contracts, the Ecuadorean government pays private companies a fixed price per barrel. It then resells the oil at the market price. In other words, it takes all the upside from price rises. (This new policy was the cause of several of the country’s big expropriation disputes.) A subset of service contracts allow private companies to help Ecuador’s state-owned companies (Petroamazonas and Petroecuador) extract oil, also at a per barrel fee. Finding out Ecuadorean operating costs has proven remarkably hard, although there is some rough evidence that costs have recently risen rather dramatically. What we do know, however, is how much money crude oil extraction has generated for the Ecuadorean state. That revenue, in real terms, has fallen 55% since 2013. On a per barrel basis, revenue for the state has fallen 56%. Of course, prices have also fallen. Ecuadorean exports fetched $95.63 per barrel in 2013, $84.14 in 2014, and $42.00 in 2015. (Those are weighted averages.) That is a ... 56% decline, which is the same as the per barrel decline in state revenue. So not much evidence that resource nationalism has hurt revenues from those data. In short, Ecuador’s oil policy has not led the country to do worse than would be expected given the crash in oil prices ... but it is possible that an alternative policy would have kept government revenues from falling quite as far. Now, Mexico’s oil tax policy is not particularly recommended. It is fiendishly complex, but it essentially boils down to a tax on Pemex’s gross revenues. The result is a company starved of resources and declining production. (Down 10% on 2013, whereas Ecuador is up 3%.) It is not clear that Mexico is an example to emulate. But at least from these data it appears that Cad was incorrect when he wrote, “Mashi Correa’s greedy and short-sighted gamble was a disaster and now the people of Ecuador stand to suffer.” Rather, thus far his oil policy seems to be holding up remarkably well both in comparison to the price crash and to at least one benchmark comparison. Colombia may have done better; when we have the numbers, I will analyze them. Evaluating the size of the problem means constructing a counterfactual: how much income would the government be taking in under a different fiscal regime? As of this moment, I do not yet have the data to construct that counterfactual. We do, however, have the data to get a general idea of how the oil price crash has affected Ecuadorean public finance. Now, it should be noted that Ecuador is much more oil-dependent than Mexico. In addition, it does not have its own currency. As a result, an oil price crash will hurt Ecuador through channels other than public finance. That said, public finance is still the main channel; it is also the main way in which Ecuador’s policy of paying companies a fixed price to extract the oil will hurt the country should oil prices crash. This post is not going to evaluate the cost of Ecuadorean resource nationalism. It is just going to lay down the fiscal context for such an evaluation. Oil income has plunged since 2012, but the government has made up for it via other taxes. (Of course, those taxes do impose a burden on the domestic economy, so it is not a free lunch.) Oil revenue is down 63% since 2012 (a fall of $3.8 billion), replaced by a 43% hike in income taxes (raising an additional $1.4 billion), an 18% increase in VAT ($1.1 billion), a 30% rise in tariffs ($0.8 billion), and a whopping 92% increase in other nickle-and-dime taxes ($1.4 billion). This is painful, but it is responsible. It also explains much of why President Correa causes such outrage among a certain class of Ecuadoreans: taxes on wealthy people really have increased quite substantially during his administration, especially in the last three years. His opponents are not responding to his rhetoric. They are responding to real economic pain that he has imposed upon them, although it is worth noting that even now income taxes in Ecuador raise revenue equal to only about 5% of GDP, up only a single percentage point since 2012 and two percentage points since Correa took office in 2007. In short, the adjustment to lower oil prices in Ecuador has been hard but not catastrophic. It is not immediately obvious what other course the government should have taken; in fact, if you take 2012 as a starting point, the situation has been well managed. Of course, it is not unreasonable to take 2007 as a starting point. Perhaps Ecuador should have spent less during the boom, but that is at best unclear: the country’s physical infrastructure was in woeful shape and has improved substantially. Its Human Development Index went from 0.698 in 2005 to 0.732 in 2013. The improvement is not stunning, but it is not terrible. (It is roughly the same proportional rise as in Mexico.) Perhaps Ecuador could have achieved that without the run-up in public spending, but that is not clear. What is clear is that Ecuador is not Venezuela. Which brings us back to Cad’s implicit question: could Ecuador have avoided the 63% fall in oil revenue after 2012? We will take that up in another post; but first, any comments? International arbitration is a potentially powerful tool for investors. They can use it to attack governments that have changed contractual terms. Sometimes those defenses are battles by robbed investors against unfair expropriation; sometimes they are attacks by international oligarchs on the democratic rule of law. Usually, they are both. But there is a problem for investors: arbitration is slow and expensive. This is true even after a decision comes down. To enforce you need to go to national courts and start chasing down assets and sales. That is doable, but it is not easy. As a result, most arbitrations are settled after a decision comes down, simply to spare the investor the hassle. What we do not know is the gap between the awards granted and the amount paid. In 2012, ICSID ordered Ecuador to pay Occidental Petroleum $1.77 billion plus interest. In total, that came to $2.26 billion as of 2012, compounded at 4.188%. After that, the award accrued interest at the 6-month LIBOR (compounded monthly), which would put its total value at $2.29 billion as of November 2015. That month, a second ICSID panel granted a partial annulment, reducing Ecuador’s liability to $1.07 billion. (Page 133; explanation here.) With interest, that would make the November 2015 value of the award $1.38 billion. In short, yes, countries pay arbitration awards. They pay those awards because private companies can impose very real sanctions if they do not pay. But the system is slow and expensive ... to in this case almost a third of the headline value. Whether that is a feature or a bug probably depends on your politics. Now that the New York Times has breathlessly put Chinese imperialism in Ecuador on the front page of its Sunday edition, I feel like I must point out that China is securing neither physical supplies of Ecuadorean oil nor favorable prices. And it is certainly not earning rents on the money it lends the Ecuadorean government. China may be buying goodwill and it may be buying the rights to develop some of the last untapped conventional oilfields on Earth ... but it is getting neither cheap. We covered physical shipments back in 2012. Nothing has changed. Most of the molecules pulled out of the ground in Ecuador wind up in Californian refineries. What about price? The oil might physically end up in California, but most of it passes through Chinese ownership. In theory, that would give the Chinese middlemen monopsony power. In practice, it does not. In fact, the Chinese overpay for the oil. Up until 2012, the loans-for-oil deals required the Chinese lenders to take Ecuadorean oil in repayment valued at a premium over the WTI price. In December 2012, Ecuador stopped charging a premium for its oil. That sounds like maybe perhaps now the Chinese were finally taking advantage of their position ... but such a conclusion would be wrong. Traditionally, Ecuadorean oil traded at a discount under WTI because it was of low quality and could only be sold to California refineries unless it was shipped through the Panama Canal. In 2012, however, for the first time ever, Ecuadorean crude sold at a premium over WTI around US$4 per barrel. (Californian refineries needed that heavy oil.) The Chinese buyers did not wish to pay a premium over the premium, and so the Ecuadoreans agreed to deliver the oil at the market price. Maybe the contracts were just folderole? Perhaps canny Chinese traders managed to squeeze out monopsony profits regardless? Well, we can check that. PetroEcuador sells its oil mostly to Chinese buyers. The private companies operating in Ecuador do not. (They technically turn their oil over to the Ecuadorean government for a per-barrel fee, which then sells it back to them, at which point they sell it again at a further markup upon which they pay taxes.) The prices at which PetroEcuador and the private companies sell their oil is publicly available. And what do those prices tell us? The blue line shows the difference between the price charged by PetroEcuador (which sells to the Chinese) and the price charged by the private producers. PetroEcuador generally receives more money per barrel. In fact, PetroEcuador managed to take advantage of a spike in Californian prices in early 2011 that passed the other producers right by. OK, then. The oil is still going to California and the Ecuadoreans are receiving a good price. So maybe the Chinese are charging extortionate interest on their loans? It certainly could be. But again, that is easy to check. How do the terms on the Chinese loans stack up against those offered by private creditors? The red bars show the lending rate on the Chinese loans. The blue bars show the yield on Ecuador’s 2015 bond at the time the loans were made. In every case, the red line is below the blue line. The last loan, from the Chinese Ex-Im Bank, uses Ecuador’s new issue due in 2024 as a benchmark ... which brings home just how incredibly cheap that last loan happens to be. The New York Times article mentions “steep interest payments” on the Chinese loans. I have no idea what they are talking about. The article’s phrasing, however, makes it seem as though Chinese companies take the oil for free and then charge a fee on top of that. Very misleading. Finally, love it or hate it, the Refinería del Pacífico is a purely Ecuadorean idea. If it turns out to be a bad one (I suspect it is) then perhaps one could blame the Chinese for going along Ecuadorean desires. But the refinery is not a boneheadedly stupid idea. There are real reasons to support it; opponents (like myself) are making a judgment based on the risk of failure; reasonable people can disagree about whether the potential reward is worth the risk. Moreover, most of the debt for the refinery will be effectively collateralized. Many of the losses will fall on Chinese banks. The above, I think, is the opposite of imperialism. Ecuador sold the refinery idea to China and looks as though it might get the Chinese to put up most of the money and take on most of the risks. If this is a Chinese empire, it makes the American empire look well-run and logical. Which is saying a lot. Does Russian expansion matter beyond the border regions of Russia? How do we know that the taboo is effective? A case can be made that the taboo limited the extent of interstate wars in Latin America. For example, El Salvador and Honduras fought the Soccer War in 1969 over the status of Salvadoran settlers in Honduras. Since annexing the area settled by Salvadorans was not a possible outcome given the taboo, the OAS (and behind it, the United States) had the leverage to force Salvadoran troops to withdraw. In another example, Peru and Ecuador fought the Cenepa War in 1995. Neither side could reasonably expect to gain or lose any territory outside the disputed region, which made Peru more willing to accept a limited Ecuadorean victory even when Peru had military superiority. (See pages 2 and 3 at the link.) In short, one might believe that the taboo kept both wars from spiralling into protracted total conflicts. OK ... but the taboo did nothing at all to stop Israel from annexing some border regions. Nor did it prevent the Eritrean-Ethiopian War from turning into a protracted total conflict. Similarly, Paul Collier made arguments that Africa might in theory be better off if governments feared that their states might be forcibly absorbed by neighboring states — but he rejected the implications of that idea by arguing that the lack of interstate conquest was overdetermined: the international taboo was just one of many obstacles to a would-be empire builder in modern Africa. (See pp. 184-85 of Wars, Guns, and Votes.) Considering those examples, perhaps other factors were at work in keeping Latin American wars from spiralling out of control. The debate matters. If the taboo is key, then Putin’s actions matter beyond near-abroad of the Russian Federation. Successful expansion opens the door to similar actions all over the planet. But if the taboo on conquest is just a reflection of some other deeper cause, then current Russian actions have implications only for future disputes that involve Russia. Interstate relations between other countries won’t change. David Weman is correct that this will be the only successful non-colonial annexation outside Israel, but maybe that does not matter. So which is it? Does precedent matter? Will we see territorial aggrandizement that would not have happened absent current Russian actions? On October 5th, 2012, a split ICSID tribunal awarded Occidental Petroleum $1.8 billion ($2.3 billion with interest) for the assets the Ecuadorean government expropriated in 2006. The Correa administration did not just take Oxy’s stuff for the hell of it. Or even necessarily for the money. (Although that probably was a factor.) Rather, the ostensible reason was that Oxy had sold a 40% stake in it operations to a Canadian company (Encana) in contravention of Ecuadorean law, which clearly stipulated that all such sales required ministerial approval. The ICSID tribunal decided that expropriation was disproportionate to the offense (Ecuadorean law being mum as to the penalty) but knocked 25% off of Oxy’s interest in determining compensation. Ecuador, understandably, has filed to annul the decision. Oxy asked to be allowed to enforce the decision (i.e., go after Ecuadorean assets and income streams in foreign courts) while the annulment proceeded. They said that they earned 12.6% on their assets while the tribunal granted then only 4.2% interest, and so they were losing money. And here it gets interesting: the Ecuadorean attorney general stated that Ecuador “does not adopt the same controversial position as the Argentine Republic in ICSID proceedings – i.e. that the enforcement obligations under Article 53 of the ICSID Convention are conditioned upon an award-creditor having recourse to a domestic enforcement procedure in the host-country. Rather, Ecuador’s position as a matter of law, is that ICSID awards are not subject to judicial review by local courts and that the obligation of Ecuador to comply with an award is not conditional upon recourse to a domestic enforcement procedures.” Moreover, the government acknowledged that the award was binding even though the country’s Constitutional Court has declared the Ecuador-U.S. bilateral investment treaty to be unconstitutional. Finally, ICSID pointed out, in somewhat annoyed terms, that Oxy was just making stuff up when they claimed that Ecuador had failed to pay past judgments. Rather, it had only lost two: in one with Duke energy it paid and with another with Oxy it placed part of the award in escrow while a further arbitration determines if the award was too large. In short, ICSID found that Ecuador has a track record of paying in the past and has promised to pay in the future. From a putatively Bolivarian government, this is rather interesting. It also puts that Ecuadorean debt default and buyback of 2009 in a rather different light. Was it a sign of an irresponsible government defaulting for the hell of it ... or a sensible decision for a country locked into a currency union to rid itself of foreign debt when it was still cheap to do so? This just in: Edward Snowden finds the perfect place of asylum! No matter where I move on this great globe, I will be a Jets fan until the very end. And do not be thinking that I might give up the Yankees! Not within the American League at least. That is all. It looks like Ecuador is backing away from Snowden. Their position now boils down to the following: if he can get here (or at least to one of our embassies) then we will consider his petition. The reason does not seem to be American pressure. The first arrow in the American quiver would be Ecuador’s preferences under the Andean Trade Preference Act. Only now Ecuador has unilaterally renounced its benefits! So it ain’t that. Rather, it seems that the diplomatic staff in London was going off the reservation and giving the impression that Julian Assange ran Ecuadorean foreign policy. So President Correa cooled things off by stating that Ecuador would do nothing unless and until Snowden got to its territory. If I had to guess, I think that Ecuador would grant asylum if Snowden could get there. I think it is a risk that Mr. Snowden should be willing to take. The question really is whether the Russians (and Cubans, since no Ecuadorean jet can reach Moscow directly and the only commercial flights go through Cuba) will let him. I have no doubt that Raúl Castro would be fine with letting him change planes. The Ecuadoreans might be reluctant to let him board a TAME flight in Havana without a passport (although I would bet that Correa would let him) but that would mean only the need for a flight through Venezuela. And honestly, President Maduro would not have a problem. So it is up to President Putin. Alas for Mr. Snowden. What does Putin want? So, it’s Ecuador. Good move. Second, President Correa is already on-record as supporting Julian Assange. In theory, if the U.S. really wanted to, it could squeeze Ecuador’s economy until the pips squeak. (Ecuador refines most of its consumption of fuel in the United States.) In practice, that isn’t going to happen. Ecuador would likely resist, the attempt would generate outrage across Latin America (and be of dubious legality) and at best the U.S. would simply get custody of a man who no longer poses any national security threat. Finally, he can get a pretty good quality-of-life. Cuba is ... well, Cuba. Venezuela has out-of-control crime, an economy careening towards collapse, and a burgeoning political crisis. Ecuador has none of the above. There is some (weak) doubt about the recent decline in the homicide rate, but in general crime is, if not quite low, then well within the American experience and not something that would seriously affect day-to-day life. President Correa looks pretty secure and has not generated the kind of opposition that would throw Snowden to the United States just to tweak their Bolivarian predecessor. Finally, the economy is doing okay ... besides which I suspect that Snowden will find some way to monetize his notoriety. Like I said, smart move. There is something I love about South American interstate politics. In 2008, problems at the San Francisco hydroelectric dam led the Ecuadorean government to cancel its $243 million contract with Odebrecht, a Brazilian construction company. President Rafael Correa of Ecuador sent troops to seize the San Francisco dam along with an irrigation project, a hydropower plant, a highway, and an airport Odebrecht was building. Odebrecht officials fled to the Brazilian embassy for protection. In a very 19th-century move, Brazil recalled its ambassador in response. Foreign Minister Celso Amorim said, “There are no plans for the ambassador’s return to Quito.” The Brazilians then threatened to cancel all development loans and credits. The Ecuadorian government backed down, and Brazil’s ambassador returned in January 2009. It was an unpleasant experience for the Ecuadoreans. Around the same time as it (not unreasonably) cracked down on Odebrecht, Ecuador decided to get tough with Petrobras. Again, this was not unreasonable. Ecuador had a remarkably easy fiscal regime. When the country mooted the changes in 2008, Repsol-YFP, Perenco and Andes Petroleum all quickly agreed, but Petrobras was, according to the U.S. embassy, somewhat unenthused. In late 2010, the Ecuadoreans finally passed a new oil law, transforming Petrobras’s production-sharing agreements into a service contract offering a flat per barrel fee. The changes would reduce Petrobras’s revenue (at 2008 prices) by $25.0 million per year. Petrobras demanded $344 million in compensation. In 2012, Ecuador paid $217 million. So Ecuador won! Right? Nope. First, Petrobras wrote in its annual report that the contract shift would reduce the recovery value of its assets by $174 million. $174 million < $217 million. Second, the talks between Ecuador and Petrobras failed on November 19, 2010. On that day, Petrobras shares traded at a price-earnings ratio of 8.036. Petrobras earned $25 million from its Ecuadorean assets. $25m × 8.036 ≈ $201m < $217m. If you click the above link about the price-earnings ratio, you will see that it was stable for most of 2010. What it tells you is that if Petrobras considered its Ecuadorean income streams to be at least as safe as its other income streams (which come mostly from Brazil) then Ecuador overcompensated Petrobras. If you believe that Petrobras considered its Ecuadorean assets to be more risky (and seriously, it did) then Ecuador way overcompensated Petrobras. It’s good to be the king! Welcome to hegemony, my Brazilian friends. As long as none of the states in your backyard go collapse, or go Communist, it’s a pretty good deal. Your tourists will find it less pleasant when they travel, but believe you me, being from the big boss country more than makes up for it. So enjoy it, mis amigos brasileiros. May it last until we all unite in war against the owners of the robots. How is Argentina’s nationalization of the YPF oil company panning out? In short, the nationalization has so far had the salubrious (and rather ironic) effect of getting the Fernández administration to roll back some of the more counterproductive bits of Argentine energy policy, but its confused quasi-Bolivarian foreign policy is now coming back to bite the government via the ruling against Chevron. Fortunately for Argentina (and also ironically) an imperialist foreign court in the Netherlands seems to have tossed the country a lifeline. Start with Argentine energy policy. YPF’s stock price jumped on November 29 ... because the Argentine government agreed to allow companies to sell natural gas from new developments at $7.50 per MMBTU, more than three times the previous controlled price. YPF shares then rose throughout December as it became clear that Argentina was going to raise the export price of oil from $42 to $70. In one sense, then, YPF is doing well because the Argentine government has stopped doing some ... er ... counterproductive things. This validates a hypothesis I ventured about the expropriation in a case I wrote about it: nationalization gave the Fernández administration cover to lift some unaffordable subsidies. What about attracting capital into the oil industry? In August, YPF laid out an ambitious $37.2 billion investment plan. Most of the cash is supposed to come from the company’s own earnings. (Those earning would not have materialized without the decision to raise oil and gas prices.) But it also calls for $4.5 billion from international partners and $6.7 billion in bond issues. And that is where it gets sticky. YPF’s chosen partner, Chevron, keeps getting bogged down in legal trouble. In part, that is due to the YPF nationalization. On November 20, YPF’s former owner, Repsol, sued Chevron in Spain. Repsol asked the Spanish court to issue a cease-and-desist order under Spain’s “disloyal competition law.” (“Disloyal competition” sounds weird in English; a better translation would be “unfair business practices” or “antitrust.”) On December 4, Repsol hit Chevron with a second lawsuit in New York. Chevron’s real problem is the lawsuit Ecuador launched against Chevron in Argentina. That one seems to have brought Chevron’s plans in Argentina to a halt. YPF is now on a roadshow in the UAE looking for partners. YPF has also received a pledge of $1.5 billion from Bridas Holdings. (Here is another description of the deal.) Bridas is half-owned by the Bulgheroni family of Argentina, and half-owned by CNOOC. Repsol, of course, has announced that it plans to sue Bridas. There is something odd in the Chevron travails. The courts in Argentina are not fully independent, but as Setty has pointed out, the Fernández administration has had some trouble lately getting them to rule its way. (This Economist article gives more details.) In addition, Fernández herself is probably torn between needing Chevron’s money and wanting to support her Ecuadorean ally. What you smell is confusion. My guess is that the Argentine supreme court will use the recent decision by the Permanent Court of Arbitration in the Hague (PCA) to overturn the lower court ruling and unfreeze Chevron’s assets. The PCA ruled that it had jurisdiction over the case and had previously ordered Ecuador to halt foreign enforcement actions until it made its final decision; it now holds Ecuador responsible for any damages imposed on Chevron by foreign courts. The ruling provides a basis for the supreme court to throw out the case. At that point, the action will shift to the courts in Spain. That case, unlike the one in Buenos Aires, is a black box from where I sit. It will be fun to watch. I hate the word “governance,” but it is useful. After all, there are things that are governed without a single government. When those multiple governments are hierarchically ordered (even if legally sovereign) then I prefer the word “empire.” But sometimes imperial institutions can run both ways. Quite a difference! Looks pretty damn imperial, no? You can kinda understand why President Correa wants to withdraw from ICSID and abrogate the investment treaties. Thing is, these treaties are ultimately enforced not by ICSID or some other sort of world-government-in-drag, but national courts. And the same conventions that allow national courts to enforce foreign rulings (the way Argentina lost its ship in Ghana) can be used to establish extraterritorial jurisdiction. That can do it a bit to reduce the imperial feel to the international system that protects property rights. The Ecuadoreans, in short, can use foreign courts to enforce their laws. Last year, Ecuadorean courts levied a $18.2 billion damage claim against Chevron for polluting watersheds in the country. Ecuador’s legal team knows that ChevronTexaco doesn’t have many assets in Ecuador, so its strategy is to go around the world looking for Chevron assets that it can attach. (You can read a copy of the plan from the legal team here. They call it the “Invictus memo.”) In February, Chevron won a preliminary victory when it got an arbitration tribunal to take its side. Problem is the ruling applied only to Ecuador. ... an Argentine judge has given the plantiffs all of Chevron’s shares in Chevron Argentina, all of Chevron Argentina’s dividends, its 14% stake in the Oleoductos del Valle pipeline, 40% of its bank deposits and 40% of the revenue from future Argentine crude sales! How much is the above worth? Well, I don’t know how much cash-on-hand Chevron Argentina enjoyed and it’s safe to assume that they won’t be paying any dividends as long as the judgment is in place, but it is possible to calculate the value of its crude production. (Oleoductos del Valle loses money.) The June domestic price of crude in Argentina was US$467 per cubic meter. (If you click the link and download the data, you’ll find that the price didn’t vary much.) Using production data from January through September of 2012, you’ll find that Chevron Argentina will produce crude worth about $833 million in 2012. 40% of that is $333 million; not a bad chunk of change. Of course, the Ecuadorean government will only get about 35% of that, since the income is actually due the plantiffs and their lawyers. Still, $117 million per year is nice, and if the precedent holds it could wind up with a lot more than that as more Chevron assets are attached around the world. Eventually the Ecuadorean government might even net enough to pay off Occidental. Hugo Chávez just won re-election by a convincing margin in Venezuela. If I may, my friend Francisco Rodríguez at Bank of America called it correctly. To be honest, although Capriles did have a few good poll results, most of them showed a Chávez win. Anyway, the Bolivarian Revolution will go on until 2019 , even if the President passes away in office in the meantime. His successor probably won’t be Vice-president Elías Jaua. If something happens to Chávez between now and January 10, 2017, a new election will be held within 30 days. If he passes away after that date, then the vice-president will take over, but the Veep serves at the pleasure of the President and there is no guarantee that the person in the office will be the person in the office then. In Ecuador, meanwhile, the big news concerns Assange and Occidental. With the former, not a whole lot is likely to happen. The Ecuadorians are settling in for the long haul: it is an easy way for Correa to take an anti-imperialist posture and distract attention from press measures at home. Correa is ahead in the polls for the 2013 election, but there is a while yet. What I love is that Rafael Correa is going to advise Tunisia about dealing with debt! That is awesome. Bolivia is having a rougher time. Two different groups are in conflict over the mining industry: unionized employees and cooperative independent miners. Until June, the government could play a conciliatory role, with Glencore as the foreign villian. But by nationalizing the mines, Evo has lost his cat’s paw. Now he is smack in the middle of a fight between the union and the small independent miners, which is a bad place to be. Moreover, his nationalization fights are starting to go bad. He just told a Canadian silver mining firm to go hang, no compensation. Legal recourse is not the problem, since the investment happened after Bolivia left ICSID (although there are other options, see next paragraph). Rather, the problem is that the nationalization, like earlier ones, has put the government smack in the middle of a conflict between different local interests. This is trouble. President Morales has made a habit of nationalizing something every May Day, usually with compensation, but Rurelec has taken Bolivia to arbitration over a 2010 electricity nationalization. Since ICSID is no longer available, the arbitration will be held under looser U.N. rules. The nationalization beat the hell out of Rurelec: it lost 80% of its revenues and its share price crashed from 16p to 9p (U.K.). So it wants its money. It is less clear if it can collect, although the new nationalizations are making its life a little easier. The company sounds confident. Finally, all-quiet on the Nicaraguan front, including a giant sigh of relief that President Chávez won re-election, what with this project getting underway. We think. Since its big default on its foreign debt (which I should really write about, it was ingenious) Ecuador has made a lot of oil-for-loans deals with China. The FT reported that Ecuador sold oil at $14-$15 per barrel. Felix Salmon wrote a post entitled “How Ecuador sold itself to China.” Neat stuff. But exaggerated. The Bolivarians in Quito have not sold their sovereignty to China. Here’s the deal. The China Development Bank (CDB) loans money to Ecuador. Petroecuador repays by shipping oil to China. The Chinese pay for the oil at market prices. The money is deposited in the CDB, which withdraws 21% of the revenue to repay the loan. China has made three of these loans, at fairly cheap interest rates: 7.25% for the first , 6% for the second and 6.9% for the third, at a time when Ecuador basically could not borrow and paid 8.45% on its outstanding issues. OK, then. Unless something drastically changes, Ecuador is going to pay Occidental. Maybe not for a while, but it will pay. And China does not have a colony across the Pacific, fun as it is to imagine such a thing. * UPDATE: I imagine that Petroecuador is swapping its oil for oil from other sources to send to China. PDVSA does this all the time, so it would not be unprecedented, and it would explain why the Central Bank reports almost no crude exports to the PRC despite the loan deals. Ecuador might, however, pay Oxy and stiff the other claimants. There have been some declarations in this direction. Depends on how much they think China cares about its stake. Few appreciate how Saudi Arabia undergirds the viability of this system. Ecuador exports 212,000 bpd to the United States. That is not a lot, but its sudden disappearance could upset a tight market ... except for the fact that Saudi Arabia stands every-ready to step in with its extra capacity. Next up: another entry in the long China-doesn’t-have-an-empire series. But let's start at the beginning. What happens when lawyers declare war on a country? Well, remember this post, on the U.S. sanctions against Manuel “La Piña” Noriega ? Turns out that the sanctions weren't really Elliot Abrams' idea. Rather, the credit goes to a lawyer, William Rogers, acting on behalf of his client, former President Eric Delvalle of Panama. Since the BNP was also the Panamanian clearinghouse for cashing domestic checks, the subsequent payday, March 14, became a bit problematic. How could Panamanian firms make payroll? Over 145,000 people, twenty percent of Panama’s labor force, had no access to the $30 million in wages they were owed. A general strike quickly ensued, beginning with the dock workers. By the end of March, Panama’s economy was in disarray, and the country defaulted on its foreign debts. Well, it didn't work. But think about it for a moment. Could lawyers declare war on Ecuador for defaulting on its debts the same way that they declared war on Panama for ousting a president? After all Ecuador uses the dollar. And sanctions that didn't work on a dictator might be very effective in swinging public opinion against an elected president. Maybe Felix Salmon was on to something. It all depends on whether American courts consider the Banco Central de Ecuador (BCE) to be a real central bank. If it is, then its assets are not attachable, and U.S. courts cannot interfere with its functioning. But if it isn't, well, then some enterprising lawyer could go give it the full Rogers. And wouldn't that be interesting to watch? From a big distance, that is. Correa may be worried about this possibility. The BCE is buying a lot of gold ... which is weird, to say the least. But is Ecuador vulnerable? Lawyers read this blog. So help a brother out with his research. Could somebody do to the BCE what Rogers did to the BNP, or is Ecuador safe? So why do I think that this move is stupid? After all, Ecuador is suffering from a collapse in oil prices. What’s the problem? First, Ecuador does not have to default. Debt is around 21% of GDP, and debt service is only around 1%. A balance-of-payments crisis this is not, even with the crash in oil prices. Second, Ecuador is vulnerable. I don’t know how vulnerable. Why don’t I know? Well, I haven’t been able to find Petroecuador’s balance sheets, so I don’t know how many American assets it holds. Nor do I know how many commercial assets the Ecuadorean government may hold. And I certainly don’t know how many payments to the Ecuadorean government pass through vulnerable payments centers. But the fact that I don’t know these things make me think that the country is very vulnerable. Call it a hunch, but a lack of transparency often means that there is something to hide. I should point out that I have met the fellows from Greylock and Elliott who will be going after the country. They are very very good at what they do, and they are very motivated. Third, Ecuador could use access to the World Bank. It will probably lose that. It has already lost access to Brazilian development funds. It could still be a bluff. This is just a default; many stand to profit from such a thing. The Ecuadorean government may just be engaging in a complicated political redistribution, and it will restart payments once the relevant parties have taken their profits. Alternatively, should a second Great Depression really emerge, then early default will seem like a brilliant move. But short of those two possibilities — a short-term move or a prediction of disaster — it just seems unwise to me. Now that the U.S. election is over and James Bond is officially a friend of Evo Morales, it's time to take a trip around the Bolivarian Revolution. How is the red banner faring around the continent? In Venezuela, the Revolution just won what is either an impressive victory or a debilitating blow in the gubernatorial elections. On the one hand, Socialist party candidates garnered a total of 53.5% of the vote. They also took control of most state governments. On the other hand, urban votes shifted dramatically towards the opposition. More ominously for Sr. Chávez himself, the biggest Socialist vote margins piled up in three states whose incumbent Socialist governors opposed the President’s constitutional reforms in last year’s referendum. (Monagas, Anzoátegui and, Lara.) That bodes ill.
As does the fact that Venezuelan oil is now heading for $40 a barrel. (You heard it here first!) Venezuela’s budget is a mess, and a gigantic hole has just been blown through it. Unless Chávez intends to try to emulate Plutarco Calles (or, more contemporaneously, Vladimir Putin) and become a behind-the-scenes jefe máximo de la revolución, he will be on his way out in 2012. Crossing the Caribbean to Nicaragua, we come to the interesting administration of President Daniel Ortega. One difference between Nicaragua and Venezuela is that Venezuela has a very well developed system for insuring that elections are free and fair, while Nicaragua does not. There are reports that President Ortega, it seems, has taken advantage of that lacuna to steal municipal elections. Several Sandinistas have defected, and violent demonstrations have gripped several cities, including the capital. Things could easily get worse. The Russian Federation, I should add, is a non-player here, despite its government’s pretensions. Venezuela is not a non-player, but given Hugo’s trouble at home, I don’t see him upping aid to Managua. He’s already called off a $4 billion refinery project. Anyway, I’m not sure that Ortega is at the stage where aid could help: fraud charges cross a line, and it will be hard for him to buy support back. Jinking to the north, Honduras has just joined the Alternativa Bolivariana, and the first shipment of 50 tractors from Venezuela has arrived, along with four million energy-saving light bulbs. El Universal reports that Caracas stands ready to lend Tegucigalpa about $132 million more, along with $82 million in subsidized oil for agricultural use. (It isn’t clear whether that subsidy is a standard Petrocaribe credit, or an actual grant of free petrol.) A nice economic gain for President Zelaya, with the additional benefit of sending a shot across the bow of the new American president-elect. “Pay attention to me or else!” it says. The problem, of course, is that there doesn’t seem to be a whole lot to the “or else” part. Or else Hugo Chávez will give your people much-needed aid? Okay. Latin Americans, like other foreigners, may have some trouble adjusting to a non-hysterical foreign policy coming from Washington. Jumping across the Pacific, we come to Ecuador, where President Correa recently shepherded through a new constitution. Ecuador is currently testing how easy it will be to default on its foreign debts. As regular readers know, there are cases when I think sovereign default is a great idea. In this case, I think it is pretty dumb. First, Ecuador would open itself up to lawsuits. If successful, and given the structure of the loan contracts they probably would be, then Ecuador could find its export revenues attached, or worse. With oil prices tanking, interference by the Obama Administration wouldn’t be likely. Second, Ecuador can pay. It can probably roll over its outstanding debt. Now, perhaps all the terrible things that the government claims in its audit are true, and the loans really were odious ... but I’m having trouble believing it. The claims are just too hyperbolic. Third, even though the Ecuadorean government can pay, it would have a great case in a rescheduling negotiation, what with some of its bonds trading as low as 24¢ on the dollar. So why run the risk of default when renegotiation is an option? But President Correa will do what he will do; I just wish I understood what he is trying to accomplish. Right now, he’s managed to irritate the Brazilian government by threatening to default on a loan from Brazil’s development bank, and he may be about to blunder into a very unnecessary and potentially expensive default on American creditors. To be fair, the brinksmanship to date has worked. The country is not in a technical default despite its recent postponed payment, and I suspect that fortunes may have been made by the debt’s recent dip to 14¢. But my gut feeling is that default would not be wise at the present moment. How many foreign assets does Petroecuador hold? If I am missing something, I would very much like to know what. One country that is not a member of the Bolivarian axis but which has a government that is sometimes considered to be allied to it is Argentina. Argentina has just run into a bit of trouble that might be relevant for Ecuador’s energetic head of state: the (in)famous Judge Thomas Griesa of New York has frozen $2 billion in recently-nationalized pension assets. Argentina could lose those assets on appeal; they would then be used to pay the American “holdouts” from that country’s debt renegotiation and repudiation. Ecuador could be headed for a similar problem, and that is assuming that the debtors fail to get ICSID involved. Which finally takes us to Bolivia. The country is back from the political brink. A draft of a new constitution has been agreed upon, and goes before the voters on January 25th. More interesting is the Bolivian government’s aggressive stance towards the U.S.: expelling the ambassador, the DEA, and the Peace Corps. Where will that lead? Some cogent analysis here. What do you think? And that has been your latest installment of “Around the Revolution.” Stay tuned, and hasta la victoria siempre. Rafael Correa is the president of Ecuador. He has a Ph.D. in economics from the University of Illinois. Anti-Chávez well-educated high-earning professional Venezuelan women told me on multiple occasions that they consider him very attractive. That, however, is not why he's in the news. He's in the news because Ecuadorean voters approved a new constitution today. Opponents call it “Bolivarian.” Even non-opponents have called it “socialist.” Both are silly. 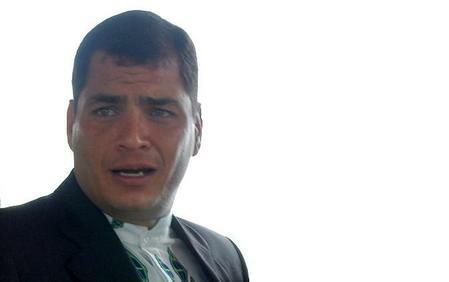 Correa is far from Bolivarian. (Update: It has been pointed out in comments that he declared himself Bolivarian in 2006, although he is generally considered to have distanced himself from Venezuela.) Those same professionals who called Correa handsome also called him sensible, and I tend to agree. Correa is relatively radical. But he's also sensible and clearly a democrat. Which doesn't mean that the new constitution is a good thing for Ecuador. What's wrong with it? Well, the the 1998 Magna Carta was pretty bad. Its most innocuous feature is a lot of blather about social policy. As regular readers know, I've argued that the evidence supports the idea that large social transfers are, at worst, not bad for growth and there is considerable evidence that they speed it up. That said, spending commitments in a constitution are generally a bad idea. Either the commitments will be dead letters, or you'll involve the judiciary in making spending decisions --- neither seems wise. More problematic was the amount of power it placed in the president. He or she had control of monetary policy. (Indirectly, since he or she appointed the central bank board, with Congressional approval. I'm neutral on dollarization, but placing control of monetary policy in the president's hands was a bad idea.) It removed cabinet ministers from Congressional oversight. It allowed the president to control Congress's legislative agenda. In fact, it prevented anyone but the president from introducing revenue bills. It limited the kinds of treaties that need Congressional ratification to those that establish "alliances" or "integration." It let the president call referenda. Plus, it bans genetically-modified products. That's just a little weird for a constitution. Still, it isn't the worst constitution I've ever seen in terms of centralizing executive power. (The 1917 constitution of Mexico was pretty bad in its original form.) And Ecuadorean political culture doesn't have a great record of hewing to constitutional rules, so it's not clear how much any of it will matter. Plus, it does permit limited presidential re-election, which is probably a good thing. In short, I'm not a big fan, but it's not a disaster relative to the previous constitution, and if the ancilliary stuff brings legitimacy to Ecuador's fundamental law, then that will be good.